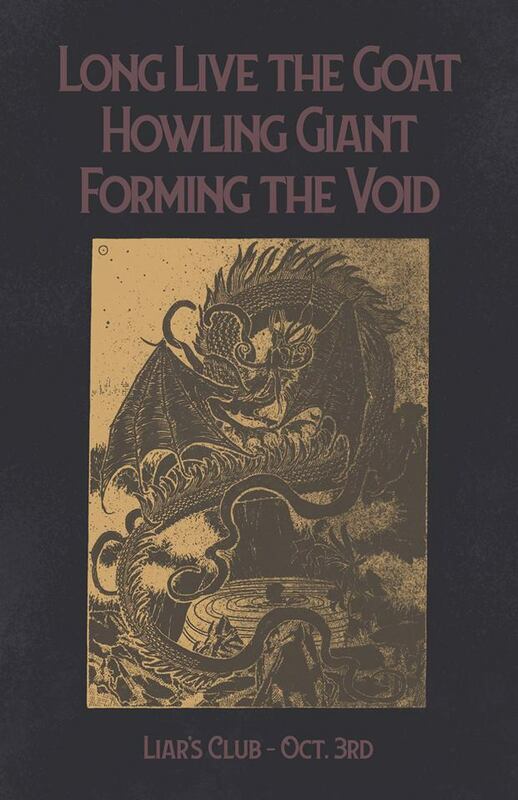 Howling Giant & Forming The Void are on the road, far from home and fixing to rage. Still high from Pyscho Las Vegas, still buzzin from Descendants of Crom… lets keep the party rolling! This big banger is for all fans of heavy riffs and doom. A show full of road warriors is bound to impress. All these guys are kings of the road and seasoned in the DIY tour lifestyle. Brushing their teeth in the bathrooms of Wendy’s or some other cheap fast food joint and spending their nights sleeping in the van (or hearse… if you’re in Howling Giant). The good ol’ rock star lifestyle ain’t for everyone, but damn it’s fun as hell. Forming the Void & Howling Giant were part of the Psycho Las Vegas lineup this year. What a kickass bill that was – High on Fire, Red Fang, CKY, Zakk Sabbath, Pallbearer, Dopethrone, Monolord, Mutoid Man…. and the list goes on and on. The fest keeps getting bigger and better every year! So good that it seems to have outgrown it’s venue at Hard Rock Hotel and will be moving on to a venue on the strip next year. A few days ago was Descendants Of Crom in Pittsburgh, PA. Another killer lineup / doom metal fest that these bands shared the stage on. This massive metal brainchild is the work of Shy Kennedy, the front woman of Horehound. This year’s fest had one more full day stacked with bands from around the country. Forming The Foid and Howling Giant teamed up to tour the midwest together on their way back home from the Pittsburgh festival. Their Chicago show is at Liar’s Club with their buds, Long Live The GOAT. The GOAT haven’t played with Howling Giant since 2016 in Nashville. This is gonna be a fun one! Based out of Lafayette, LA. Forming The Void’s “Rift” was rated #1 on the August Doom Charts. It is one hell of an album! Take a listen for yourself and checkout their music video for “Arrival” below. Based out of Nashville, TN. Howling Giant slay in all aspects of the game! Their skills are unmatched and their song writing is whimsical… like the climax of a Dungeons and Dragons game you’ve been playing for years (and you’re up against a horde of beholders and the lich king). Do yourself a favor and listen to all their albums. “Earth Wizard” is one of my personal favorite songs of their’s. Based out of Chicagoland, IL. Long Live The GOAT grew up there, but prefer the home of their big red van. Get a feel for their heavy swagger in their music video for “Drag” below. They seem to put out a 2-tracker every year. They’re about due for another one, so keep an eye on them! Next Next post: Chicago Punk Rock @ The Burlington!